They say that pyramids hold some sort of mystical (positive) power, so for the superstitious among us, why not settle for a tiny pyramid beside your bed? The Pyramid LED MoodiCare Clock will be able to get all you sleepers out of bed on time thanks to a built-in alarm clock, displaying the time, date and week so that you will be able to keep track of the next big date in your calendar. I suppose in a sense it helps add some positive vibes to your life since you won’t be late in getting up. The alarm function features 8 songs, while seven LED backlight colors help jive up your room at night. 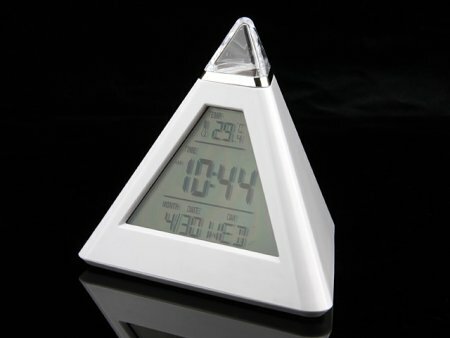 Powered by a trio of AAA batteries, the Pyramid LED MoodiCare Clock will retail for $12 a pop.